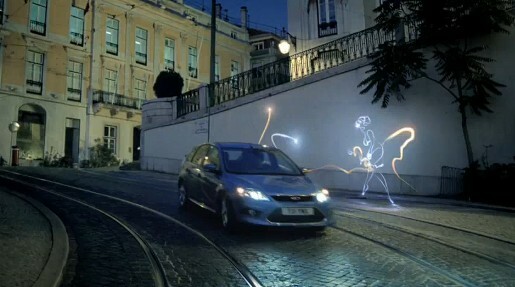 Ford is running a Pan Europe television advertising campaign for the latest model of Ford Focus, highlighting the ‘kinetic’ design with a TV advert featuring competing light beams. Bright white and orange lights follow the Focus, vying for its attention as it drives through the streets of Lisbon at night. Two light beams are attracted to the Ford Focus. As the vehicle drives through the city streets, the light beams playfully interact with it and transform into light graffiti figures of Marilyn Monroe, Paparazzi and hitchhikers who try to attract the attention of the Focus. The Orange and Light ad was developed at Ogilvy, London, by creative director Camilla Herberstein and agency producer Lyn Woodcraft. Filming was shot in Lisbon over four nights by director Vaughan Arnell via Serious Pictures, London, and Ready to Shoot, Lisbon, with executive producer Donnie Masters and producer Nicci Powers. Editor was Leo King at Cut+Run, London. Post production was done at Moving Picture Company by Drew Downes. Music for the title song, “Halfway Home”, was composed at Morgan Van Dam.